Companies like Exclusive Resorts and Quintess cater to the wealthy by giving them access to luxury home rentals at relatively reasonable prices. If you’re traveling with a family or multiple couples, it ends up being a lot less expensive than staying at a high end hotel. And it’s definitely a better deal than buying a vacation home, unless you expect big gains in property values. There’s a big “but” though. Like country clubs, you have to pay a large fee to get in. Hundreds of thousands of dollars to become a member. Here’s how the Exclusive Resorts/Quintess model works: Pay a few hundred thousand dollars and then you get to rent the homes they own for about $1,000/night. That’s not bad for, say, a $4 million home in Tuscany with five bedrooms. A home like that usually rents for 4x that. 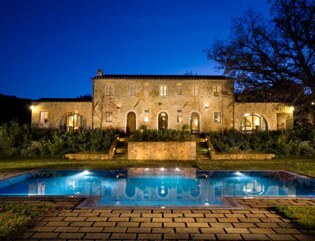 The picture above is one of the Exclusive Resorts Tuscany homes. The companies use those up front membership fees to buy the homes. That means they’re a real estate company, hoping for rising values, as well as a hospitality company. It’s modeled after country clubs, where you pay a big fee to get in and then play golf for free. The model works. Exclusive Resorts has some 3,500 members and is growing. Quintess has a few hundred members and an almost identical business model. Members get perks like an on-site concierge, daily housekeeping service and access to chefs and other amenities. And if they ever want to leave, 75% of that initial membership fee is reimbursed. Sounds perfect? Some people think it is. But when the economy goes south and everyone wants their refundable fee back, the model breaks. Ultimate Escapes went bankrupt last year based on too many people trying to bail out. Exclusive Resorts and Quintess are still around and financially healthy because they have limits on people leaving. You can get out but only if new people come in. That means the companies are doing well financially, but there are hundreds of people on a wait list to get their membership fees back. Another problem with these companies is the holiday rush. Everyone wants to be in Tuscany in the Summer, Hawaii over Christmas and a ski resort in the Winter. You have to plan your vacations a year or more in advance to get the best properties at peak times. Enter Inspirato. They don’t buy their homes, they lease them long term from owners. And they have a variable pricing model that gets rid of the holiday rush. You pay “just” $9,500 to join plus another $2,500 per year, and you can then rent the homes they offer, which range from around a few hundred dollars a day to a few thousand, depending on the property and time of year. Think of it as HomeAway without the hassle of guessing which homes are going to be great and which ones are duds. And you get the same perks, like an onsite concierge and daily housekeeping. Inspirato’s founders include the cofounder and former CEO of Exclusive Resorts, Brad Handler, and his brother Brent Handler. The company also has an innovative marketing model. If you’re a member and refer a new member you get a $1,000 credit to use towards rentals. And anyone that new member brings in gets you a $1,000 credit, too. It’s like a benign pyramid scheme, and it seems to be working well. Since launching in January, Inspirato says they’ve signed up over 100 new members. Inspirato raised $5 million in capital in August 2010.